It’s quite an experience. And it takes a lot of determination and even hard-headed stubbornness at times to move through the apparent obstacles and moments of confusion, disorientation and frustration to just keep going with it and find the joy and enchantment again. Operating in Italian for most every interaction throughout the day and into the night for late community meetings and Mediterranean dinners, there is a certain kind of passionate charge to it, an emotional depth and poetry that really can’t be reproduced saying the same thing in English. I do often feel fatigued at the “end” of the day. Routing the neural pathways of every communication through foreign language circuitry takes effort, especially since I am not using my first or second acquired language but fifth… behind English, Mandarin Chinese, Spanish and French. The Italian bureaucracy is part of the trial as well. It’s stereotyped and exaggerated, though sometimes it really is as convoluted as it is portrayed in urban myths and media. Lately, I’ve been moving through the steps of renewing my Permesso di Soggiorno (residency permit – kind of a greencard equivalent) and these kinds of processes highlight the nature of this phenomenon. It all began in the Temples of Humankind. I was the guide for a couple, Timm and Meredith, for their first visit to the Temples, and then they came to Ecstatic Dance at Damanhur, which I facilitate. They hosted me at their place in New York when I went to Omega last October, happy to have another contact with Damanhur after an enchanting visit. Then, Timm contacted me months ago because he was asked to officiate a wedding for dear friends in Denver, and he wanted a special outfit for the occasion made by Damanhurian artists. I put him in contact with the right person and facilitated the order, with the effort of conversion from inches to centimeters and various Italian vocabulary for clothing measurements. A grey suit set in cashmere and silk, the perfect mix between eastern and western style. With great distrust in the Italian postal system after precious things have already been lost between Italy and America, I told him that I would hand deliver the outfit from Damanhur to Denver. He enthusiastic about the idea, so I said, “If you help me to organize some events that I can do while I’m there, I’ll come!” Right away, we were activated. Timm introduced me to friends and friends-of-friends, until we had manifested a schedule of activity in Denver for the week before the wedding, all through Facebook. The organizers at the Fusion Factory for the Friday evening event hadn’t really heard of Damanhur until they met me online, did their research and put everything together: the art, music, film, invitations, in less than a month. Wednesday evening, I facilitated an Ecstatic Dance session at Guildwerks, another Denver community art space, with a visual journey through the Temples of Humankind in video projection. 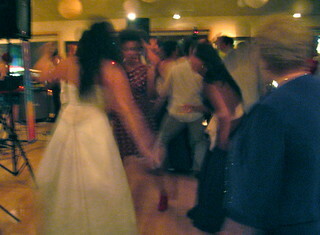 The theme of the dance: union and synchronicity, seeing as how Amber and Mike, the bride and groom were present. Thursday, I went to Rhythm Sanctuary, the weekly ecstatic dance event at Denver, and there were more than 300 people there! Waves of joy and movement. Ahva, the founder of Rhythm Sanctuary, had followed the conversation on Facebook for our event organization, and she presented me as a Damanhurian that evening, announcing the Friday event. Like on Wednesday, many people came up to me after the dance to talk about Damanhur with interest and curiosity. We were hosted at Muse’s place, and Michael came out from California to Denver for the Damanhur infused events. Muse and Michael are two friends of Timm and Meredith, and they all had met each other at Damanhur. So, in this beautiful house with Asiatic and gothic-violet decor, there was a kind of class reunion from their group at Damanhur. Saturday, the wedding was held in a sacred space called “The Starhouse” in the Boulder hills. 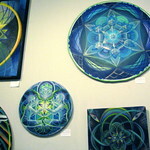 Consecrated land, round wooded structure designed with sacred geometry. Every tree was asked if it wanted to be part of the temple. Before the wedding, Timm was almost as anxious as the groom, and we went to Tonic Herban Lounge in Boulder, an oxygen bar with Atlantean paintings on the walls, where even the proprietor Mark was fascinated by Damanhur. 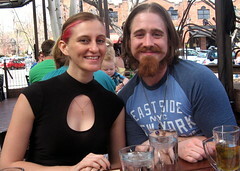 We were nourished by healthy elixirs and delectable raw vegan desserts. While all the raw cacao from the dessert probably didn’t help Timm’s nerves, the aromatherapy infused oxygen did. The wedding was conceived as an esoteric ritual, with dedicated texts and prescribed gestures, and the outfit made in Damanhur added value and magic. There was also a multicultural aspect, with the Mexican grandmother and the German one reciting prayers in their original languages. The close relatives offered blessings and strips of colored cloth placed over the hands of the couple. At dinner, planetary symbols on the candles indicated the tables for the guests, and each guest had a Thoth tarot card synchronically chosen. Mine was “Completeness.” To balance out all the spiritual seriousness, there was also a rock n’ roll side to it all. During the ceremony, the bride entered to an instrumental rendition of Guns n’ Roses’s “Sweet Child of Mine,” and after dinner, a live band played classics from the Beatles to Michael Jackson while we danced in a rhythmic pulse of celebration.